Bottom (l-r): Kerone Kearse and Cameron Thomas. Standing (l-r): Zaikai Titus, Jahmir Bloom, De’vante Mateo, Tyquil Glasgow, JoJo Jones and Jamar Williams. ROCHESTER, N.Y. — It happened on the second possession of the second quarter. JoJo Jones pushed the ball along the left side of the floor to foul-line extended. The 5-foot-10 guard went to his right for a couple dribbles before shuttling the pumpkin to teammate Tyquil Glasgow. The 6-foot-3 inch lefty gathered the pass in his trusty mitts and scored off the glass. The horn sounded and play stopped to acknowledge Glasgow’s reaching the 1,000-point club. Glasgow finished with 15 points on the night as the Monroe Redjackets improved to 9-4 on the season with a 73-64 win over Livonia in non-league action. The senior, who is fourth in the RCAC Lower Division averaging 20.6 points per game, has scored in double figures in all 13 of those games. “He’s been a constant in this program for years now,” head coach Matt McCormick said. “Not only on the point side of it, but the rebounding side of it. He’s always been a consistent scorer and I’m just glad he’s around. Fitting, too, that Jones made the pass. “He’s my cousin,” said Jones. “(He’s) my cousin, got to do us right. “Ty knows he’s a tough guard down there because his first step is so quick,” McCormick added. De’Vante Mateo led four in double figures with 30 points. The senior point guard scored nine straight midway through the first quarter as the Redjackets jumped to a double-digit lead at 20-9. Monroe did not enjoy the comfortable lead for long. Livonia’s Jalen Marshall and Alex Minnehan combined for three 3-pointers and 13 points to pull the Bulldogs within three at the end of the first quarter. Livonia connected five times from long range in the first half. Monroe limited the Bulldogs to two triples in the second half. The Redjackets played for the third straight game without starting guard Fidel Brock who has missed all or parts of the past six games. The win was the second straight for Monroe and third in its last four games. Jones finished with 12 points. Ketone Kearse added 10. Jamar Williams rounded out the scoring for Monroe with six. Marshall paced Livonia with 29 points to go with 10 rebounds for his fourth double-double of the season. Minnehan had 17 points and eight assists. AJ Davin (8), Noah Fasso (4), Shawn Minnehan (2), Steffan Gwyn (2) and Nathan Genthner (2) also scored for Livonia. 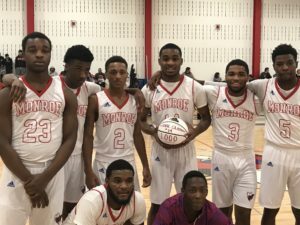 Glasgow joins Monroe Redjackets Chris Gibson, Jr. and Rayshawn Boswell who have eclipsed the 1,000-point plateau since McCormick revived the program with a freshman team in 2004. The Redjackets returned to varsity play for the 2006-07 season. Monroe was a middle school from 1988-2003.